German Lotto, known within Germany as Lotto 6 aus 49 or simply Lotto 649, is by far the most popular lottery game in Deutschland. 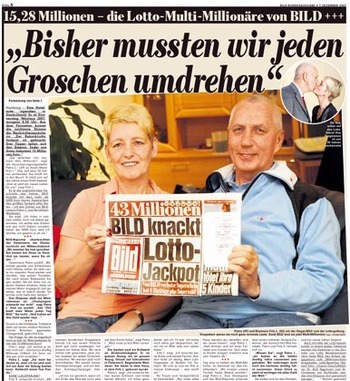 With minimum guaranteed jackpots that start at €1 million and total annual payouts in the billions of euros, German Lotto turns ordinary people into millionaires every single week. As a result, this bi-weekly draw has been attracting the attention of lottery players (just like you) from far outside Germany’s borders for years. German Lotto has a fruitful history, having made countless people richer since its first draw took place on October 9, 1955. This makes it one of the oldest still-running lotteries in not just Europe but also the entire planet. The game is operated by Deutscher Lotto- und Totoblock, also known as Lotteriegesellschaften, which is a partnership between the lottery operators of 16 different regions in Germany. To keep things fair and interesting, each of these regions manages the entire group for three years, at which point the torch is passed on to the next group. Up until 1982, German Lotto was only a weekly draw that took place on Saturday nights, but that year the organizers decided to double the excitement by adding a Wednesday night draw as well. In terms of its format, German Lotto originally had a 7/38 matrix, meaning players had to correctly choose 7 numbers from a possible range of 38. However, this was updated in June 1986 to the 6/49 format (“6 aus 49” literally means “6 out of 49”) the game has today. Furthermore, in May 2013 the “Superzahl” super number was introduced. The addition of the Superzahl made the odds of winning the jackpot more difficult, but since the prize tier structure was also adjusted at this time, it made the overall odds of winning a prize significantly better—from 1 in 54 to 1 in 31. The format of 6aus49 is quite simple and shares some characteristics with many other international lotteries as well as the US Powerball. Any players who want to play first need to choose 6 numbers from a range of 1 to 49, which is among the most common range of numbers used in different lotteries worldwide. However, whereas players in the Powerball and other similar lotteries would get to choose their own Powerball/super numbers, German Lotto works a bit differently. The super number, which is called the “Superzahl”, comes in a range from 0 to 9, but players are not able to choose it themselves. Instead, it is printed on each lottery ticket automatically as the final digit of the ticket number itself. Therefore, even if a single lottery ticket has multiple lines on it, the Superzahl will be common to all of them, making this a very interesting and unique aspect of German Lotto. While some players might not like the fact that they don’t have control over this part of the game, it makes things a bit more exciting in some ways because you have to leave that part up to chance. The main six numbers are chosen from one machine, and the Superzahl is chosen from another. If you win all seven numbers, you win the jackpot. However, there are nine prize categories in total, with the smallest prize up for grabs being rewarded to players who match two of the main numbers and the Superzahl. The guaranteed minimum jackpot for the Wednesday draws is €1 million, while for the Saturday draws it’s €3 million. Although there is a rollover cap that kicks in to roll down the winnings to the secondary tier on the 13th draw, the jackpot can grow exponentially long before then. The odds of winning the German Lotto jackpot aren’t the worst, but at 1 in 139,838,160 they are certainly far from great. Yes, these odds are much, much better than SuperEnaLotto (1 in 8,415,060), Mega Millions (1 in 302,575,350), and the US Powerball (1 in 292,201,338), but they are identical to the odds of winning the EuroMillions jackpot. Considering EuroMillions jackpots can climb into the hundreds of millions of euros, that might be a better lottery to play overall. However, since the German Lotto jackpot can eventually roll over into the secondary prize tier, your chances of winning at that point would certainly improve a lot. Also, the likelihood of winning some sort of prize is 1 in 31. At the same time, there are other lotteries out there, including EuroJackpot (1 in 95,344,200), Swiss Lotto (1 in 31,474,716), and Austria Lotto (1 in 8,415,060), that offer much better odds right from the get go. German Lotto draws take place twice per week on two different days and at two different times. The Wednesday draw occurs at 6:25 pm CET, while the Saturday draw occurs at 7:25 pm CET. The location of both draws is Saarbrücken, Germany. All prizes won in the German Lotto are paid out in cash as one lump sum. If you prefer lotteries with an annuity option for its jackpots, look elsewhere. If you win a prize, you won't need to pay any taxes in Germany regardless of the size of the prize. However, if you’re playing from abroad, it’s always best to check your local tax laws to see whether you’ll have to pay tax to your own government for any winnings you claim elsewhere. If you’re a resident of Germany or someone going there for a visit sometime soon, you can easily purchase tickets to German Lotto by going to a local lottery ticket kiosk. But what do you do if you live abroad and want to try out this lottery too? The best way to do so is through one of the top online lottery sites. These sites offer great interfaces, excellent customer service, and years of experience that will streamline the entire process for you. In addition, once you’ve signed up, you’ll have the freedom to play many other lottos from around the world as well. German Lotto 6 aus 49 – Is It Worth Playing? 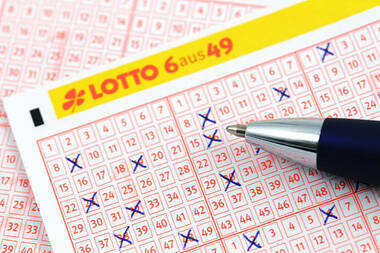 German Lotto, like German food, is rich and fascinating and no doubt will appeal to many people all over the world. Although there exist other lotteries that have better odds yet similar jackpots, that shouldn’t stop you from trying German Lotto, especially since the overall odds of winning a prize are 1 in 31. The game continues to make many people wealthy every single year, and the minimum jackpots, especially the €3 million that’s always available for the Saturday draws, are a sure-fire way to get lotto players excited. I always thought this was a pretty good lottery, but the author of this review is right: with odds the same as EuroMillions, which has much bigger jackpots, what's the point? Thanks for bringing this to my attention!